The AOC 961 television series is AOC's newest for 2009. The 961 series builds from our last model by offering and improved design and great picture and sound quality, with crystal clear high definition performance with a 20000:1 dynamic contrast ratio. The 32" is great for those who are looking for the best in value and performance. With inputs such as HDMI (3) for the best connectivity. I bought one of these almost 2 years ago Christmas 2010 approx. It was on sale 299 at Radioshack. Its a great TV. AOC has been around a long time. I use to sell this brand back in the 80's and they were good tv's back then. I bought it mainly for a pc monitor but I do have over the air broadcast tv going quite a bit also. My only complaint is the slow tuner. Wishlist would be - it could use a little beefier audio section and video out (composite at least) would be neat. Overall, very happy with it. I have this HDTV hooked up using an HDMI cable to a cable box. Because HDMI is a digital interface, it provides the best quality video. Among the important new advanced features are there are now two types of auto picture control. Dynamic Picture Control, which automatically adjusts the backlight and the Adaptive Contrast Control which adjusts the Gamma functions to produce greater brightness. The best improvement over the previous model is a higher Dynamic Contrast Ratio. Your basic controls now all have a much increased range. They go from 0 to + 100. Except for backlight which goes from 0 to + 30. The backlight control has a big effect on a LCD HTDV's picture. So the increased range really helps to improve the picture. AOC could have easily stopped there with their new improvements, but they didn’t. They also added Audio and Video presets which were noticeably lacking from their previous model. For Video they added Vivid, Standard, PWR (Power Save), Theater, Sport, and Custom preset modes. For the Audio the presets there are Standard, Movie, News, and Custom. Also new for the audio is AVL which automatically keeps the volume at one consistent level. This is great to use during those annoyingly loud commercials. In the Movie mode sound quality is improved. However, the overall sound quality in all other modes could still use some improving. This model has the same three color temperature modes. (Normal/Warm/Cool). I prefer the "cool" mode which appears to give a brighter and more colorful picture and tends to enhance the color Blue. While Warm enhances the color Green. Normal is the default setting. The AOC L32W961 also offers four levels of digital video noise reduction. Low, Mid, High and Off. The default setting is Mid. All of which work much better than the previous models video noise reduction settings. I would only recommend the high setting for use with a real grainy video. The AOC L32W961 has a much wider viewing angle than the previous model. Even if their specifications don't prove that. You could sit just about anywhere in the room and not have to use the swivel base to turn the TV towards you. Also improved is the new response time. This AOC now has a very fast response time of 6.5ms. Which helps to eliminate any blurring when you are watching movies with fast motion scenes or sporting events. Source switching is almost instantaneous. CBS & NBC broadcast in 1080i format, while FOX & ABC broadcast in the 720p format. So you want a HDTV with as little format switching delay as possible. Of course there are your usual LCD HDTV Aspect Ratio modes. Each manufacturer likes to give them their own unique names. In AOC's case they are simply called, Auto, Normal, Zoom, Wide, and Cinema mode. The standard 16x9 aspect ratio is very accurate and shows very little overscan. LCD HDTVs must overscan the image so that older programming will be framed as intended to be viewed. The menu interface to get to all these controls has gotten a total makeover. It looks great and now has a transparency control. Setting this on 10 makes the menu totally see-through. So you could make all your adjustments without having the menu interfere with the TV picture. The new remote controls design is well thought out and very comfortable to use. It includes a menu naviagating control, and a source button which brings up a list of all the inputs. It highights in bright orange the current active input. The remote also has individual buttons for every input source. Such as HDMI , Component, Composite, PC. It also has buttons for the audio & video preset modes.As for the input jacks, AOC has added a third HDMI input along with an additional Component Video. So you’re probably wondering with all these new features, how the picture looks. Well I'm happy to say it has also seen a big improvement. Most likely as a result from the higher Dynamic Contrast Ratio and the adaptive picture control. Watching a highly contrasted movie like "No Country for Old Men" was a pleasure. All the details in the shadowy night scenes were brought out with exquisite and extensive detail. The color accuracy is slightly better than the previous model. But it's difficult to improve on what was near perfection. In the standard mode setting all controls are set to the halfway mark of +50 and makes for a very neutral picture. PWR save mode makes the picture fairly dark and is best for a very bright room. In the "vivid” picture setting mode you get an extremely bright , colorful, and sharp picture. It may be overly bright and sharp for some viewers. Which is why the default "mid" noise reduction setting automatically turns on. It seems to make the picture a bit soft. Which is why I don’t really care for mid being the default setting. Low would have been a better choice as the default. What you might want to do is keep all the suggested settings of the vivid mode, then turn off the video noise reduction. Now the setting turns to "custom" and you still have all the benefits of the "vivid" mode. Theater mode helps improve contrast for a dark movie. In Sports mode ball games have a brighter and well detailed picture. In some HDTV's the Sports mode increases the response mode to help elimnate blurring. It's not mentioned in the manual. So just by viewing a ball game I am unable to tell whether that's the case with this TV. 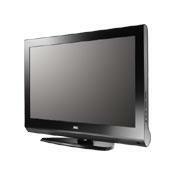 Like the previous model this AOC HDTV earns a Energy Star logo. It uses even less energy than any of thier previous models. Most likely you will have to spend much more for a TV that has the picture quality and features of the AOC-L32W961. The AOC brand, is the worlds largest display manufacturer and are a leading brand in Europe. They are continuing to make major inroads into the American market. Here in the U.S.A they are sold almost exclusively by Radio Shack and Target.